New Delhi-10.01.2019;AMENDMENTS IN THE MINERAL AUCTION RULES . The Mines and Mineral Development and Regulation Act, 1957 was amended in 2015. Subsequent to the amendment, the Ministry of Mines notified the Mineral Auction Rules, 2015 on 20/05/2015 to prescribe the procedure of the auction process. Auction of concessions for major minerals (other than coal, petroleum and natural gas) was done for the first time in the history of mineral administration in the country. 53 blocks were successfully allocated. The value of minerals auctioned out is Rs. 2,25,850.97 crore. Revenue to states over lease period are estimated at Rs. 1,83,181.59 crore. The additional revenue on account of auction process is Rs. 1,43,169.29 crore. The Ministry of Mines was monitoring the process very closely with the state governments. The consensus emerged that the Mineral Auction Rules need to be amended to make the process more pragmatic without sacrificing the checks on successful bidders. Accordingly, the Mineral Auction Rules have been amended on 30/11/2017. The lease period of merchant miners extended under the section 8A(6) of the MMDR Act, would expire on 31stMarch, 2020. The auction process needs to be initiated well in advance to ensure a seamless transition from the existing to the new lessees as the new auctioned leases and that the mineral production is not affected due to expiry of these leases. Exploration of the blocks was required to done for the auction process of these mineral blocks. For expediting the exploration in these mines to be make them auction compliable, sub rule 4A was inserted in Rule 12 of Mineral Conservation and Development Rules, 2017 (MCDR-2017) by way of an amendment notification, published in Gazette of India vide G.S.R. No. 289 dated 27.03.2018. The rule mandates exploration in G2 level as stipulated under clause (a) of rule 5 of the Mineral (Evidence of Mineral Contents) Rules 2015, to be carried out in the mining leases expiring in 2020 by 1stApril, 2019. The rule also lays down the timelines for implementation of the exploration plan prepared with the approval of IBM for satisfying the requirements. GSI has launched National Aero-geophysical Mapping Programme to cover 27 lakh line km of Obvious Geological Potential (OGP) and adjoining area in the country, The mapping of the total area divided into 12 blocks is envisaged to be completed in a period of 3 years by 2019 with total estimated cost of Rs.351 crore. Ministry of Mines vide its order No. 15/1/2017-M.V dated 14.08.2017 had constituted a Committee under the Chairmanship of Dr. K, Rajeswara Rao, Additional Secretary, M/o Mines, to review the National Mineral Policy, 2008 in accordance with the judgment dated 02.08.2017 delivered by the Hon’ble Supreme Court in the matter of Common Cause Vs. UOl & Ors. [Writ Petition (Civil) No. 114 of 2014]. Based on the report submitted by the committee on 31.12.2017. Ministry of Mines prepared a draft National Mineral Policy (NMP) 2018 and uploaded it on the official website of the Ministry on 10.01.2018 for seeking comments/suggestions from the Stake Holders. After suitably incorporating the comments/suggestions received from the concerned, a draft Cabinet Note on NMP 2018 was prepared and circulated to the concerned Ministries/ Departments for their comments/ views as part of the Inter Ministerial Consultation. Comments/ suggestions received from the Ministries/Departments have been suitably incorporated. Ministry of Mines, in its endeavor for taking up exhaustive and universal implementation of the Sustainable Development Framework (SDF) in mining, has evolved a system of Star Rating of Mines. The Ministry of Mines instituted the Sustainable Development Framework (SDF) for taking up mining activity, encompassing inclusive growth, without adversely affecting the social, economic and environmental well-being, at present and also in future generation. It has been institute as a two tier system providing self-evaluation templates to be filled in by the mine operator followed by validation through Indian Bureau of Mines. Based on the performance of the mining lease, 1 to 5 star rating, the positive impact of getting higher Star Rating will drive miners to quickly adopt sustainable mining practices. The Star Rating has been included as statutory provision in the MCDR for time- bound (2 years) achieving of minimum 4 stars. A web enabled online system for evaluation of measures has been developed and launched on 18th August, 2016 as a vital step for ensuring compliance of environmental protection and social responsibility by the mining sector. A template for star rating of miner minerals is also being prepared. Since its inception, 9 mines in July 2016, 32 mines in February 2017 and 57 mines in March 2018 have been awarded “Five Star” rating so far, for assessment years 2014-15, 2015-16 & 2016-17 respectively. For the Assessment Year 2017-18, 966 mine operators have submitted online templates till date, out of which 246 lessee have self assessment of Five Star. Field verification/validation by IBM is in progress and so far 20 mines have been rated as five star. Mining Surveillance System (MSS) is a satellite-based monitoring system which aims to establish a regime of responsive mineral administration by curbing instances of illegal mining activity through automatic remote sensing detection technology. Ministry of Mines & Indian Bureau of Mines (IBM) have developed the MSS, with assistance from Bhaskaracharya Institute for space applications and Geo-informatics (BISAG), Gandhinagar and Ministry of Electronics and Information Technology (MEITY). The system works on the basic premise that most minerals occur in the continuity and their occurrence is not limited to the lease area but is likely to extend in the vicinity. The MSS checks a region of 500 meters around the existing mining lease boundary to search for any unusual activity which is likely to be illegal mining. Any discrepancy is found is flagged-off as a trigger. The MSS is a transparent & bias-free system, having a quicker response time and capability of effective follow-up. The deterrence effect of ‘Eyes watching from the Sky’ would be extremely fruitful in curbing instances of illegal mining. A user friendly mobile app for MSS has been created and launched on 24th January, 2017 at Gandhinagar for enabling public participation in assisting the governments endeavor to curb illegal mining, which was being used by the inspecting officials to submit compliance reports of their inspections. In the initial phase, a total of 296 triggers across the country covering a total area of 3994.87 hectares wherein, 48 unauthorized mining have been detected after inspection of the triggers by the state government officials. The training of all the States for its adoption of the MSS for minor minerals has also been done. In the second phase, 52 major mineral triggers, have been detected from the 3280 plotted leases (Working Mines 1689 plotted out of 1694 and Non Working Mines 1596 plotted out of 2129 ) across the country, out of which 36 have been verified by the State Governments and in 4 cases unauthorized mining activities have been identified. Similarly, in respect of minor minerals, so far, 130 triggers have been generated, out of which 62 have been verified and in 5 cases unauthorized mining activities have been identified. GSI has completed 8652.5 sq. km Specialized Thematic Mapping (on 1:25,000 scale) out of 22,865 sq. km target during Annual Programme 2018-19 till the end of November 2018. GSI has completed 62,032 sq. km National Geochemical Mapping (on 1:50,000 scale) out of 1,78,356 sq. km target during Annual Programme 2018-19 till the end of November 2018. GSI has completed 42,804.5 sq. km National Geophysical Mapping (on 1:50,000 scale) out of 78,150 sq. km target during Annual Programme 2018-19 till the end of November 2018. GSI has completed preliminary marine mineral investigation for 24583 sq. km in Exclusive Economic Zone (EEZ) out of 24,000 sq. km target during Annual Programme 2018-19 till the end of November 2018 and close grid mineral investigation for 1959 sq. km in EEZ out of 3500 sq. km till the end of November 2018. GSI has been engaged in 45 programmes of National Landslide Susceptibility Mapping (NLSM on 1: 50,000 scale) during 2018-19. GSI has covered 30,900 sq. km by Landslide Susceptibility Mapping out of 77,000 sq. km target during Annual Programme 2018-19 till the end of November 2018. GSI has digitized all its mineral exploration, baseline data generation, fundamental geoscience and Geoinformatics reports and uploaded 22641 reports in OCBIS Portal. In the calendar year 2018, GSI has reported augmentation of natural mineral resources to National Mineral Inventory (NMI of Indian Bureau of Mines) of copper (38.832 million tonne), iron (163.134 million tonne), bauxite (3.13 million tonne), limestone (2013.77 million tonne), gold (0.9437 million tonne), potash (10.80 million tonne), andalusite (34.35 million tonne), Lead & Zinc (4.34 million tonne), REE (0.046 million tonne) and coal (6346.97 million tonne). Geological Survey of India (GSI) has signed MoU with National Remote Sensing Centre- Indian Space Research Organization (NRSC-ISRO) on 05.09.2018 to utilize airborne hyperspectral data by the scientists of GSI and ISRO to find surface signatures of mineralization in 14 promising areas in the coming 3 years; with National Geophysical Research Institute (NGRI), Hyderabad on 25.10.2018 for analyses for NGCM samples; with IIT (Indian School of Mines), Dhanbad on 16th August 2018 on Collaboration for Academic and Research Program; with Haryana Sarasvati Heritage Development Board (HSHDB) on 20th August 2018 on the “comprehensive studies to reconstruct the fluvial history of the palaeo course of ancient Sarasvati River system in parts of Himachal Pradesh, Haryana, Punjab, Rajasthan and Gujarat” and signed a Memorandum of Agreement (MoA) on 03.05.2018 for outsourcing ground geophysical survey (Gravity and Magnetic) to CSIR-NGRI, Hyderabad over an area of total 25,000 sq.km. The “Program 100×100 VAQ (Visibility, Activity, Quality) Enhancement Model” was launched by the DG, GSI, through Video Conference from Oldham Hall, CHQ Kolkata on 14.8.2018. GSI deployed an experimental People-centric Landslide Early Warning System at Giddapahar Village, Kurseong, Darjeeling district, West Bengal. GSI has implemented an integrated IT-enablement system – Online Core Business Integrated System (OCBIS) with a goal towards comprehensive data management across Missions and Support systems. OCBIS has facilitated digital data collection from field, online submission and tracking of samples, end to end field season project management, and dissemination of data and products through a single standard based interface to all stakeholders, including Ministry of Mines, national and state level earth science organizations / departments, industry and citizens. Recommendations of the Committee for review and restructuring of the functions and role of the Indian Bureau of Mines (IBM) for manpower creation was optimized by the Ministry of Mines without considering increase in sanctioned strength in consultation with the Department of Expenditure, Ministry of Finance.The Department of Expenditure and thereafter the Cabinet accorded approval to the proposal for upgradation, creation and abolition of certain posts of Joint Secretary-level and above but maintaining the total cadre strength of IBM at the existing strength of 1477. The detailed discipline-wise, revised sanctioned strength of IBM is notified vide Gazette Notification No. 31/72/2009-M.III.Vol.I (part–I) dated 15th May, 2018.For implementation of new manpower strength, finalization of recruitment rules of various disciplines is in progress. The IBM is in the process of establishing a MTS, which would primarily involve automation of the entire mineral concession life-cycle, starting from identification of the potential mineralized area and ending with closure of the mine; and connecting the various stakeholders for real-time transfer of electronic files and exchange of data. M/s Wipro has been identified as implementing agency andM/s NISG, Hyderabad as Project Management Unit(PMU)for MTS. Later on PradhanMantriKhanijKshetraKalyanYojna (PMKKKY),was included as a part of MTS. The SRS Document of PradhanMantriKhanijKshetraKalyanYojna (PMKKKY) along with System Design Document (SDD) for Phase-1 was approved on 30.01.2018 by Core Committee. Three modules of MTS Project viz. PMKKKY, Registration and Daily Returns were launched by Honorable Minister of Mines Shri Narendra Singh Tomar on 20.03.2018 during 3rd National Conclave on Mines & Minerals at New Delhi. PMKKKY is currently live w.e.f. 27.08.2018 for data entry at district level and most of the States have started data entry. The Grievance Management and Mobile app for PMKKKY will be launched shortly. The Registration and Return modules will also go live shortly. IBM has signed a MoU with National Remote Sensing Centre (NRSC), ISRO on 21.01.2016 to undertake a pilot project on “monitoring of mining activities using satellite imagery and capacity building of IBM officers for three years including technical support for setting up of remote sensing laboratory in IBM”. Two Remote Sensing Labs are being set up at Hyderabad and Nagpur. AnMoU has been signed with MOIL Ltd. on 25.04.2018 for field use of the remote sensing technology. IBM is vested with the responsibility to review the threshold value of minerals periodically under sub rule 7 of rule 12 of Mineral Conservation and Development Rules, 2017. In order to take stock of the situation and assess the stakeholder’s views through deliberations, IBM invited comments and suggestions from the stakeholders and general public and also organized a series of five workshops on “threshold value of minerals at Goa, Bhubaneshwar, Naumundi, Gandhinagar and Nagpur during the year 2017. After examination of the suggestions and comments of the stakeholders through an expert committee constituted for the purpose and based on the recommendations of the committee, the threshold value of eleven minerals are notifiedvide Notification No. C-284/3/CMG/2017 Dated 25.04.2018. The Company registered more than 100% growth in net profit i.e. Rs. 1,342 crore in FY 2017-18 against Rs. 669 crore in previous year. The Net sales turnover for the year is Rs. 9,376 crore (highest ever since inception) registering a growth of 26% over last year. Export earning of Rs. 4,076 crore also highest ever since inception registering a growth of 12% over last year. The Company paid highest ever dividend since inception amounting to Rs. 1102 crore (114%). CAPEX of Rs 1080 crore achieved in FY 2017-18 is highest since FY 2009-10. In FY 2017-18, NALCO has spent Rs. 29.01 crore towards CSR activities against allocated fund of Rs. 27.88 crore. Joining hands with Hon’ble Prime Minister’s call of Beti Bachao & Beti Padhao Abhiyan NALCO has adopted 100 poor & meritorious girls in FY 2017-18 (Cumulative- 277) under Nalco Ki Ladli scheme. Under Prime Minister’s Swachh Bharat Mission and Iconic Shrine Development Programme, the Company has taken up 22 projects for comprehensive development of the holy city Puri. Some of the projects completed under this program are development and beautification of Gandhi Park, installation of 12 nos. of water posts to supply safe & clean drinking water, renovation of museum inside the Shree Jagannath Temple and facilitating commutation for senior citizens and differently-abled through launching of Battery Operated Vehicles. To provide better health-care services to inhabitants of periphery villages, NALCO is operating 9 Mobile Health Units (MHU) at Angul and Damanjodi. More than one lakh patients treated through the MHUs in 2017-18. Launched Free of cost Battery-operated vehicle service for senior citizens, differently-abled passengers and sick people in twin city Bhubaneswar- Cuttack. Health Care: Foundation stone laid for construction of a night shelter at AIIMS, Bhubaneswar in Aug’18 which will benefit the attendants and patients coming from far flung places. Construction of Super specialist eye care centre at Angul is in full pace which will cater to the critical care needs of interior masses. NALCO has taken up beautification of Shri Jagannatha Temple, Puri under Swachha iconic city initiative. Shri Jagannatha Temple illumination completed. Both side walls of VIP road, Puri beautified with thematic painting based on Jagannatha culture. Renovation and beautification of Gandhi Park taken up at Puri. During the year 2017-18, JNARDDC filed a record eight patent for indigenous R&D process developed. One patent was granted for the process for preparation of light weight Foamed bricks (LWFBs) utilizing red mud and fly ash admixture. Two copyrights were granted for software developed for real time determination of liquid us temperature and for cost optimization of recycling of different types of aluminum scraps. Director, JNARDDC being the Chairman of task force of aluminium sector nominated by Bureau of Energy Efficiency (BEE) contributed appreciably by monitoring the evaluation of energy audit reports of Indian aluminium industries for setting up normalization patterns for evaluating the performance of industries in terms of energy efficiency. 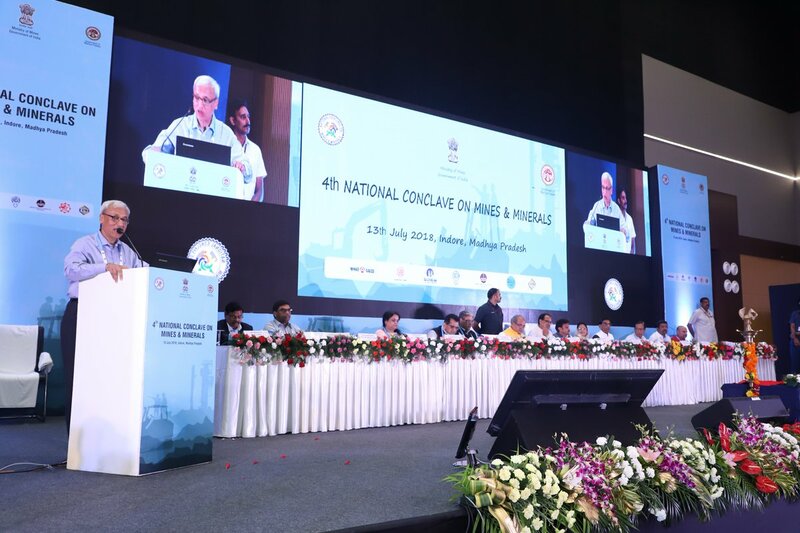 Ministry of Mines organized the 4th National Conclave on Mines & Minerals on 13th July, 2018 at Indore, Madhya Pradesh. State Mining ministers, officials of central ministries including MOEFCC, officials of the state government, CEO’s of mining industries, industry associations, academic institutions and others participated in the conclave. For the first time, conclave had an exhibition in which States put up stalls to showcase their mineral blocks which have been prepared to be put up on auctions in year 2018-19. The agencies concerned with pre-auction preparations such as Exploration agencies (GSI & MECL), transaction advisors (SBICAP, CRISIL, KPMG), DGPS survey agency (MECON), etc also put up their Stalls. IBM & MoEFCC also put up stalls on mining plan and EC & FC processes. Participation from the public sector and private sector companies in the exhibition on mineral and metal industry also provided an overview for better appreciation of mining sector by the investors in terms of making investment decisions. Two technical sessions were also held during the conclave. The State governments showcased the mineral blocks which are to be auctioned in the financial year 2018-19 in the first technical session. In the second technical session, presentations for the different stages in auctioning of a mineral block and its operationalization were highly appreciated. Hon’ble Mines ministers also held a round table conference with the industry leaders, in which several key issues related to statutory clearances were discussed and sought suggestions in improvement and development of the mineral sector.